Going to Pacific Grove is a little bit like cutting into your birthday cake and watching M&Ms spill out. It will surprise you, and at the same time, you'll be wondering why no one ever told you about it before. You could be excused for not knowing much about Pacific Grove. Its neighbors are so well known that its easy to get dazzled by busy, former cannery town Monterey or forget to look elsewhere while relaxing in precious, cute Carmel. With all that going on, it's easy to overlook the little town on the end of the Monterey Peninsula. By comparison to its neighbors, Pacific Grove is like the shy kid standing off to the side at the prom: pretty but unnoticed. Take a closer look, and you'll find a less-touristed place to visit, a town full of lovely Victorian-era architecture and surrounded by spectacular scenery, with a down to earth ambiance. Located on the southwest corner of the Monterey Bay at the tip of the Monterey Peninsula, it has a stunning coastline that's easily accessible by automobile - some lovely small hotels and B&Bs - and a walkable, friendly downtown. You could visit Pacific Grove while you're weekending in one of the other area towns, but if you're looking for a quiet, laid-back place to enjoy the area, Pacific Grove may be your best bet. What are you waiting for? Start planning your weekend getaway using the resources below. Why Should You Go? Will You Like Pacific Grove? You might especially enjoy Pacific Grove as a change of pace if you've already visited the other Monterey Peninsula towns and are looking for something different. You may also like Pacific Grove if you prefer a quieter place to stay where you can walk through town without worrying about getting run over by other dazed tourists. It's also the best place to find a charming bed and breakfast to stay in, including some that have gorgeous ocean views. If you want to visit the other towns on the Monterey Peninsula while you're there, try the Monterey getaway guide or find out how to spend a weekend in Carmel-by-the-Sea. Pacific Grove weather is best in spring and fall when the skies are clearer and crowds thinner. In summer (especially June), you're more likely to encounter fog and cloudy days when the ocean marine layer never clears. The drive along Ocean View Blvd. from the Monterey Bay Aquarium to Asilomar State Beach is just as pretty as the 17-Mile Drive, and it doesn't cost a penny to take it. Bring a picnic, bring your camera, or just bring a good book and read it while sitting and listening to the surf. This map shows the route. 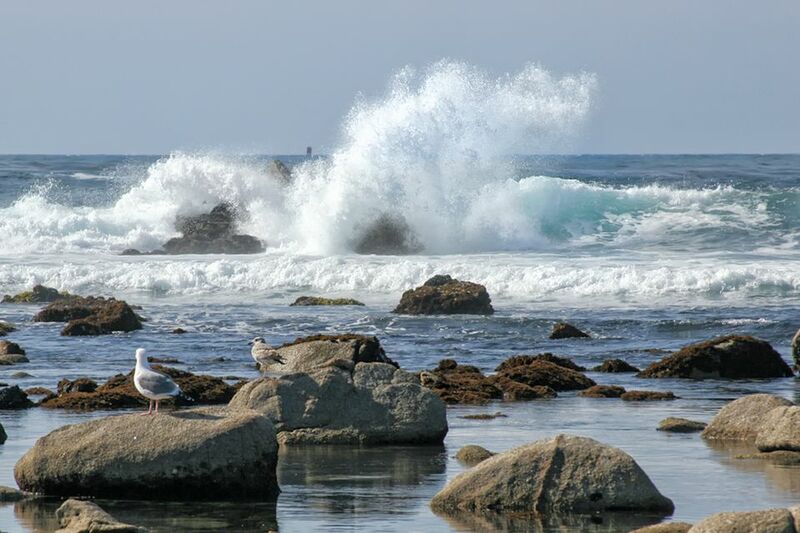 For more ideas, check out the top things to do in Pacific Grove. Feast of Lanterns: Held in July, this festival has been around for more than 100 years. Events include a pet parade, entertainment, a beauty pageant and sand castle building contest. The Monterey Bay Half Marathon takes place every fall. Hotels are likely to get filled up, and the course runs along the scenic coastal drive, blocking it to automobile traffic. Even if you aren't running, it's a good idea to know the date. Butterfly season runs from October through early March, when the colorful orange-and-black monarch butterflies spend the winter in the pine and eucalyptus trees around town. The town holds numerous events to celebrate their tiny visitors. For breakfast, locals head for Aliotti's Victorian Corner (541 Lighthouse Ave) for a hearty breakfast served in a lovely dining room, especially nice on a warm day when they open the windows. Red House Cafe (662 Lighthouse Ave) is also popular and well-regarded. You'll find some excellent small hotels and unique bed and breakfast inns in Pacific Grove. You can find the perfect place to stay by browsing reviews and comparing prices at Tripadvisor. Pacific Grove is on the western tip of the Monterey Peninsula. It's west of Salinas and 75 miles from San Jose, 115 miles from San Francisco, 190 miles from Sacramento and 325 miles from Los Angeles. Nearby Monterey has a small airport that receives some commercial flights (MRY), but the nearest big airport is in San Jose (SJC).